October 2006These award-winning dancers, aged 8-19, returned for their third tour with us. Their dances, blending gymnastics, ballet, and theatre, ranged from traditional to more contemporary. They never failed to enthrall the audiences they performed for. Their spirited performances were enhanced by their beautifully-made and colorful handmade costumes. To enable the audience to connect with the dancers on a deeper level, each performance was introduced by an “Up Close and Personal” video showing the dancers at home in their native St. Petersburg. 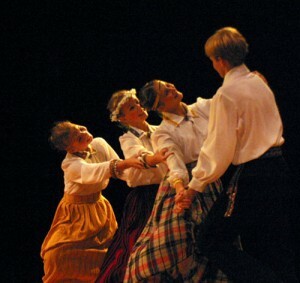 As part of Creative Connections’ 2006-7 International Young Performers’ Tour, Rossijanochka gave 20 performances and many dance workshops at 15 schools and art centers in the Tri-State area. Over 9000 children, teachers, and family members saw them in action.